Debate is not an option, people; If You Can Believe Your Eyes and Ears is one of the greatest debut albums in the history of pop music. 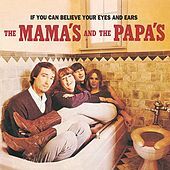 The Mamas and The Papas possessed it all: a truly great songwriter in John Phillips, sublime harmonies with the power of psychic transportation, a phenomenal backing band (The Wrecking Crew) and charisma out the wazoo. Oldies radio has been playing the majority of these songs to death for decades now, and yet their energy, charm and glow remain intact, as if the quartet somehow encased them in a magical bubble that will ward off time's decay for all eternity.